Moyamoya disease (MMD) is a progressive disease of the cerebrovasculature characterized by unilateral or bilateral large vessel stenosis or occlusion with associated microvascular proliferation. The incidence is highest in Asian populations, with a prevalence in Japan of 3.2–10.5 per 100,000 people . The disease can be congenital with a presentation in children or adults or can be acquired as moyamoya syndrome as a secondary response to a primary vascular occlusion. Options for treatment include direct superficial temporal artery to middle cerebral artery (STA-MCA) bypass or indirect bypass. Direct bypass can have some advantages in certain patient groups and is practiced in specialized centers for patients in whom there are donor and recipient vessels of sufficient size for direct anastomosis. The main benefit to the procedure is that it provides immediate augmentation of flow to the ischemic cortex. 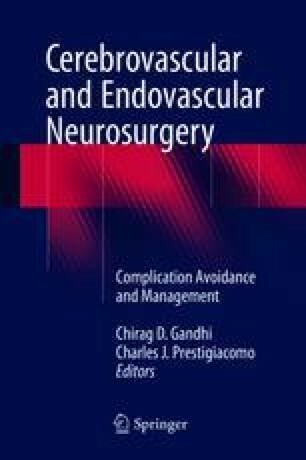 Disadvantages of direct bypass include intracerebral hemorrhage secondary to hyperperfusion of anastomotic failure and cerebral infarction.